Not too long ago, those ugly knitted Christmas jumpers that you got every year from your gran would have gone straight into the charity bag. 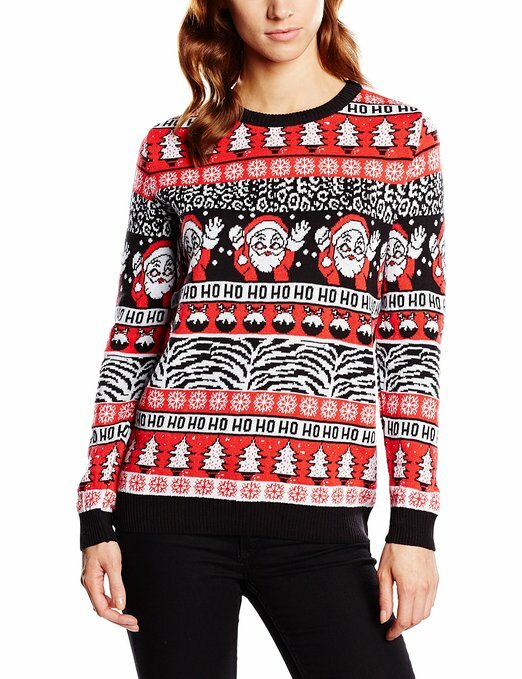 But now novelty Christmas jumpers are the height of fashion! Celebrities have helped bring reindeer and santa patterned knitwear back into fashion (was it ever really in fashion before?!) and now big name designers as well as high street favourites like Top Shop and Urban Outfitters all offer their own ranges of funky Christmas jumpers. Whether you’re nostalgic for granny’s xmas jumpers of your youth, you want to win the prize for the ugliest Christmas jumper this year, or you just love ironic hipster fashions, you’re sure to find the jumper for you in this list! 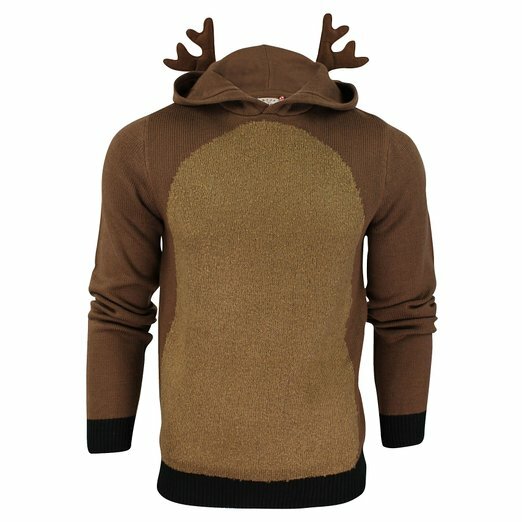 There are plenty of Christmas jumpers around with reindeer designs but not so many that actually make you look like a reindeer! This cute hooded knit jumper is great for a xmas pub crawl, fancy dress or just to look adorable at Christmas time. There’s also a penguin version and santa suit (complete with beard) versions. This slim-fit Christmas jumper is ideal for wearing on Christmas day or at any time over the festive period and has a fun and unusual pattern of robot santas. Buy from Not On The High Street. Have a sense of humour? or looking for a secret santa present for a cheap friend? 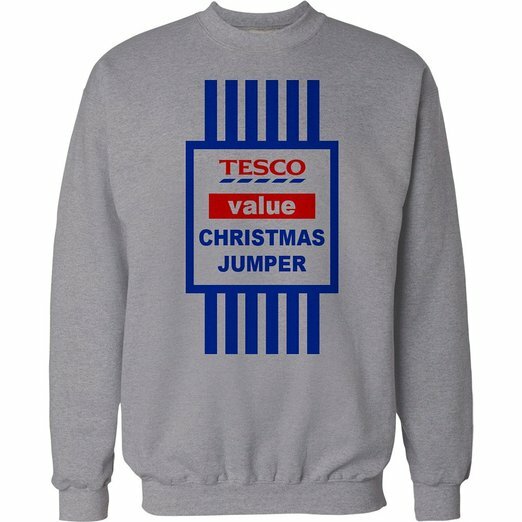 This sweatshirt printed with the Tesco value branding makes for a funny Christmas outfit that is sure to get lots of comments. This festive and funny Darth Vader jumper makes a great gift for Star Wars fans. The unisex design comes in a range of different sizes. More of a Dr Who fan? Don’t worry, we have a jumper for that as well! 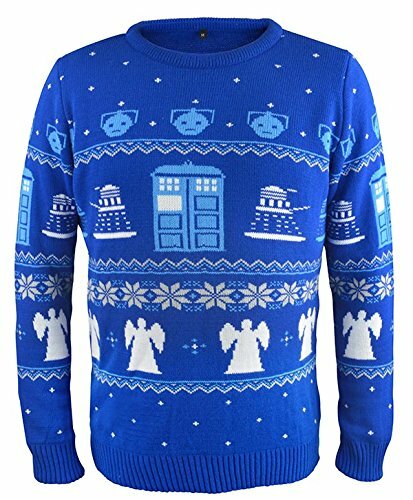 I love how this design blends the traditional nordic patterns of snowflakes with the tardis and daleks. This is an official BBC product and makes a great gift. And here’s one that Game of Thrones fans are sure to appreciate! This festive design with reindeer and Christmas trees is unisex and comes in a variety of different colours and sizes. 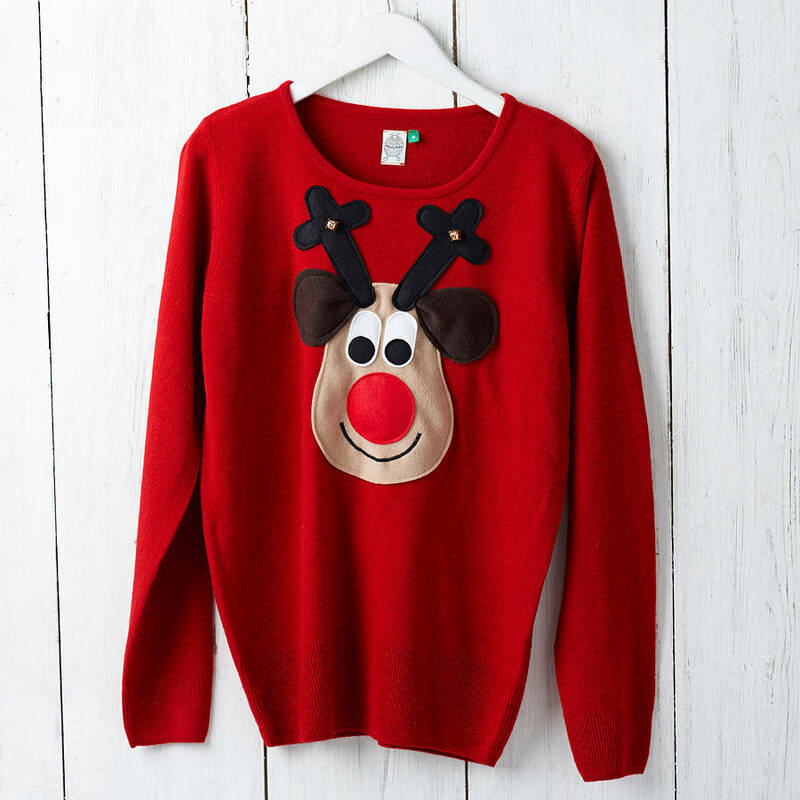 This adorable ladies Christmas Jumper features a rudolf motif with a nose that squeaks and jingle bells antlers. Made from cozy fleece it will keep you warm on the coldest of December nights and is available in sizes 8-22. Get it from Not On The High Street. Another cute Christmas jumper for the ladies. 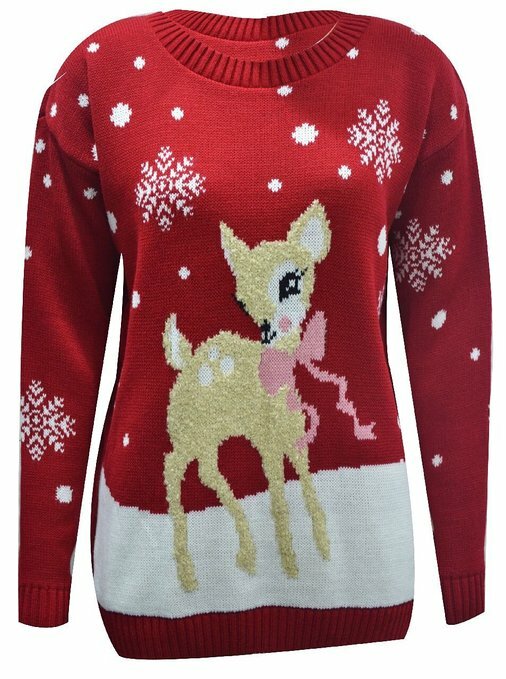 This one features a knitted design of a bambi-like baby deer with snowflakes. As well as red, it also comes in a black and grey version. 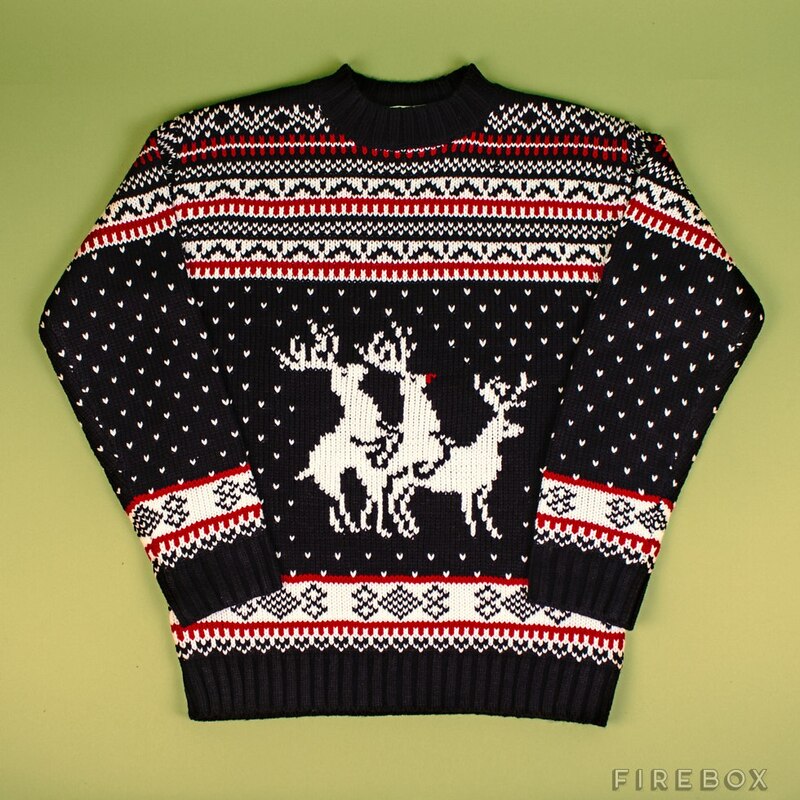 A novelty Christmas jumper for those with a sense of humour. 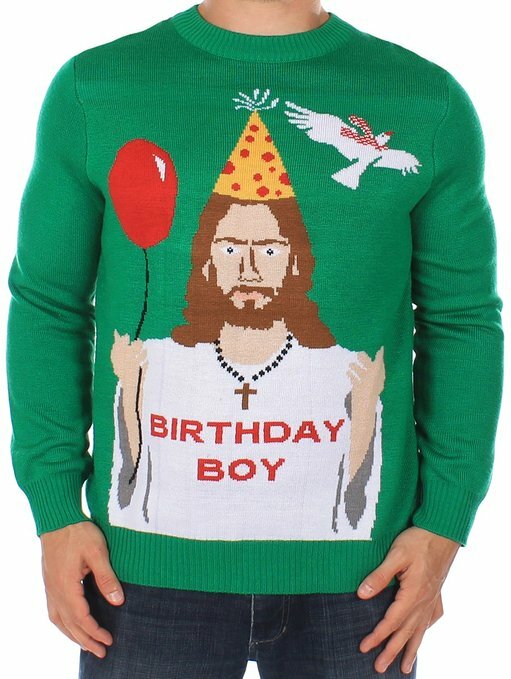 This knitted jumper has a design of jesus sporting a party hat and “birthday boy” t-shirt, holding a balloon. Comes in a variety of sizes. 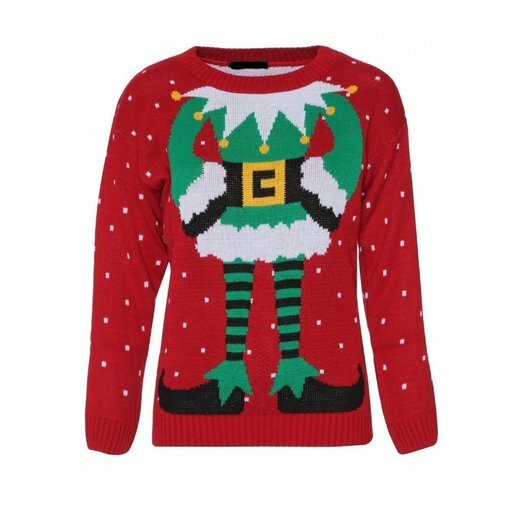 This funny Christmas jumper lets you be an elf for Christmas and is inspired by celebrity fashion as Sam Faiers from TOWIE posted a snap of her wearing a similar one on Twitter. Comes in red and black and a range of sizes. 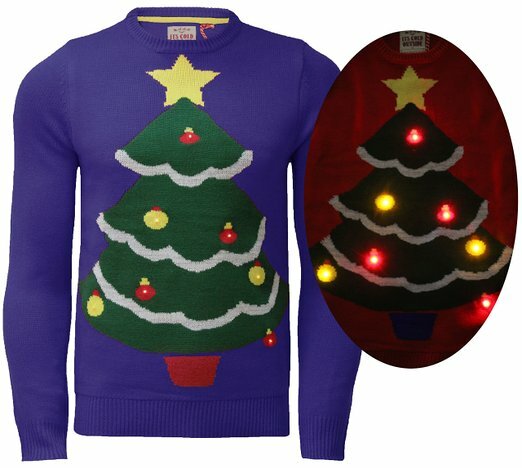 If you really want to up the stakes then check out this light-up Christmas Jumper which features a knitted Christmas tree with real LED lights. Great for drawing attention to yourself when you’re out on the town for Christmas drinks! 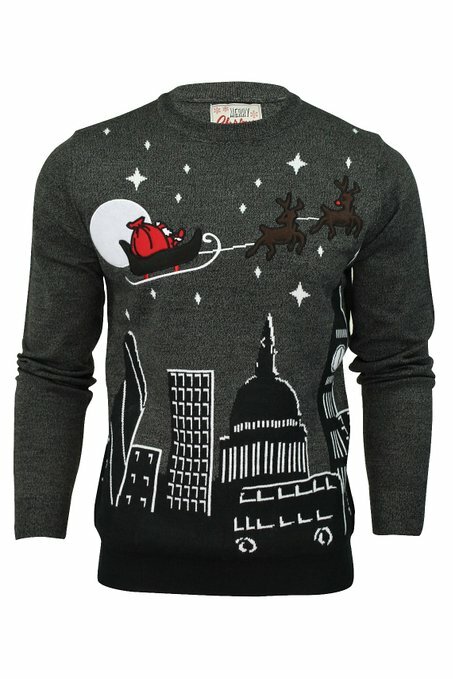 This funky Christmas jumper features a night scene of London with some iconic landmarks and a double decker bus, with santa and rudolf flying their sleigh overhead. It’s available in blue or grey and a range of different sizes. A lovely tasteful Christmas Jumper for those who find the other designs a little garish. 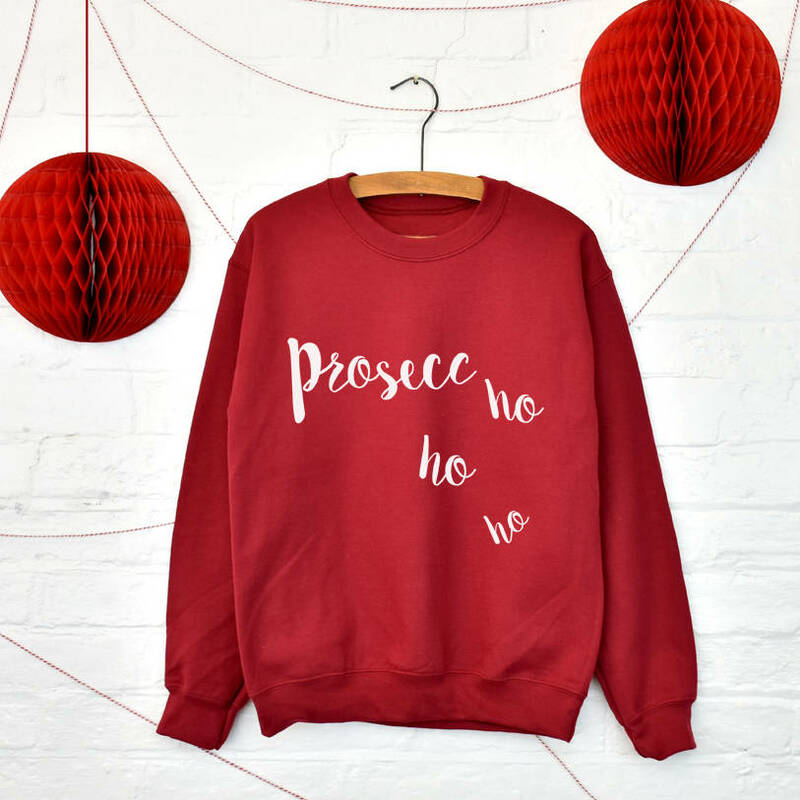 Prosecco Christmas Jumper I know a few prosecco fans who would appreciate this festive “Prosecc ho ho ho” sweatshirt. It’s unisex, available in four different colours and sizes, and you can buy it from Not On The High Street. 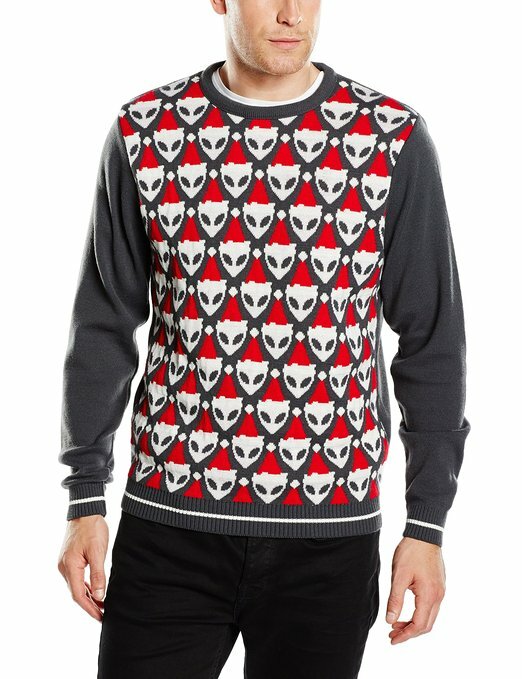 This trendy knitted xmas jumper has an all-over pattern of alien heads wearing santa hats. It’s available in size 36-46″ chest. If you can’t decide between santa, christmas trees, christmas puddings or snowflakes, this jumper includes them all in festive stripes of black, white and red! 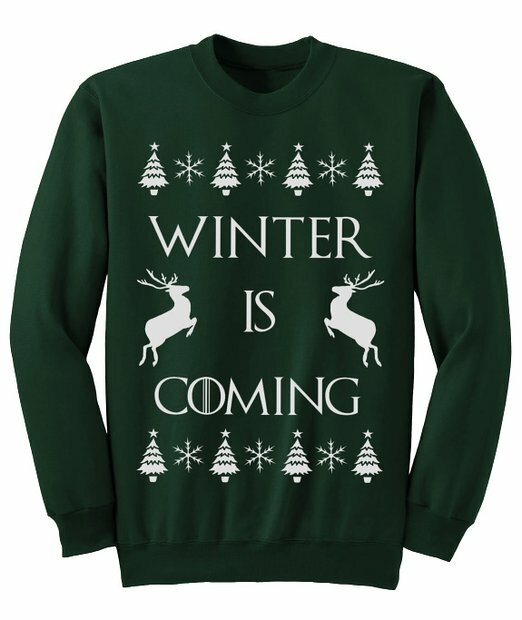 This is one of the coolest Christmas jumpers I’ve seen that manages to be ironic without being over the top. 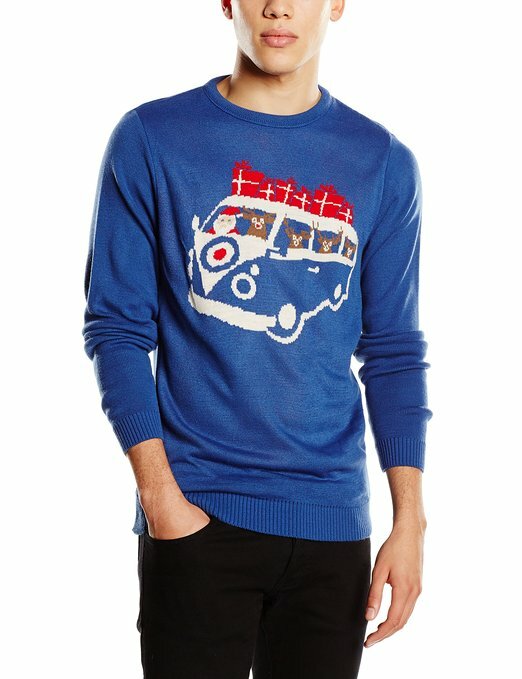 Great for lovers of vintage fashion, it features a knit design of santa and his reindeers in a VW van piled high with presents. 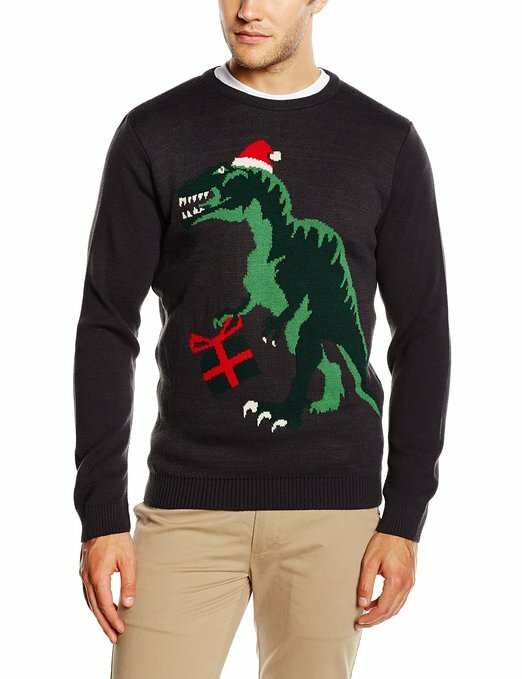 Another cool jumper by designer Run & Fly, this one featuring a T-rex who’s getting in the Christmas spirit with a santa hat and present. 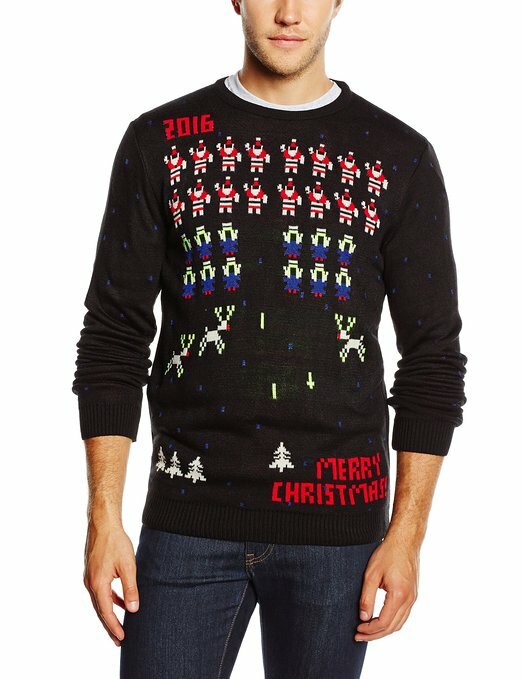 A great Christmas and New Year jumper for anyone who loves retro computer games. The design features a space invaders type game with christmas trees, reindeer and santas. None of the jumpers in this list quite what you’re looking for? Well how about making your own! This kit includes everything you need to make the ugly Christmas jumper of your dreams including cotton knit jumper in red and green, reindeers, snowflakes, pompoms, bows, pipe cleaners, googly eyes, glitter gel, bells and ornaments, gold bead necklace, stencils, glue and sewing kit. Get it from Firebox.